Noyon (pop. 14,500) is a small town on the Oise River and the Canal du Nord. Originally a stronghold of the Veromandui, a Celtic tribe of Belgic Gaul, Noyon later developed as the Roman civitas of Noviomagus Veromanduorum (literally "new plain of the Veromandui"). Like many cities in northern France, Noviomagus had ramparts from the 3rd century to protect it from Germanic attacks. 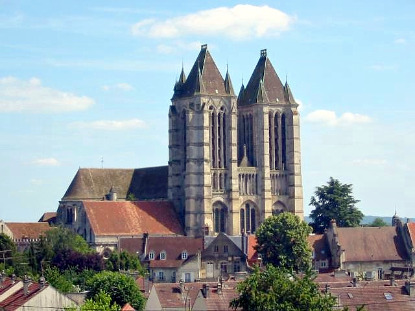 In 531, Saint Medardus moved the seat of the diocese of Vermandois to Noyon. In 768, Charlemagne and his brother Carloman are crowned Kings of the Franks in Noyon. In 987, Hugh Capet is elected King of France in Senlis, then crowned in Noyon on 3rd July by the archbishop of Reims, Adalberon. Hugh Capet is considered the first true King of France, as opposed to King of the Frankish kingdom of West Francia. Noyon then becomes a Count-Bishopric part of the Royal Domain ("Île de France"). In 1363, Noyon becomes a fief of the Dukes of Burgundy, until 1544 when Emperor Charles V of Habsburg restitutes it to France with the Duchy of Burgundy through the Treaty of Crépy-en-Noyonnois. There is only one real sight in Noyon, the Cathedral of Our Lady (Cathédrale Notre-Dame de Noyon). 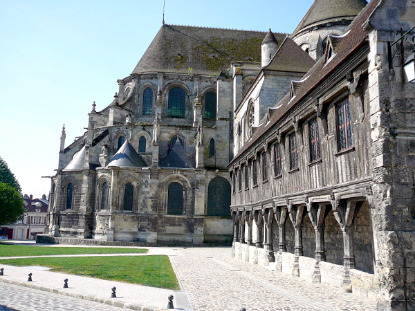 Built in 1140, it is considered to be the second Gothic-style church after the Abbey Church of St Denis in Paris, and very first cathedral erected in this architectural style (worldwide, not just in France). The transition between Romanesque and Gothic is soft in regard to the complexity of the sculptures, but evident through the high vaulting or the flying buttresses. Noyon is 100km north of Paris, 30km north-east of Compiègne, 10km east of the on the E15-E19 motorway going from Paris to Arras (E15) or Cambrai (E19). Noyon is 1h10min by train from Paris Nord station. Compiègne is only 13min away.